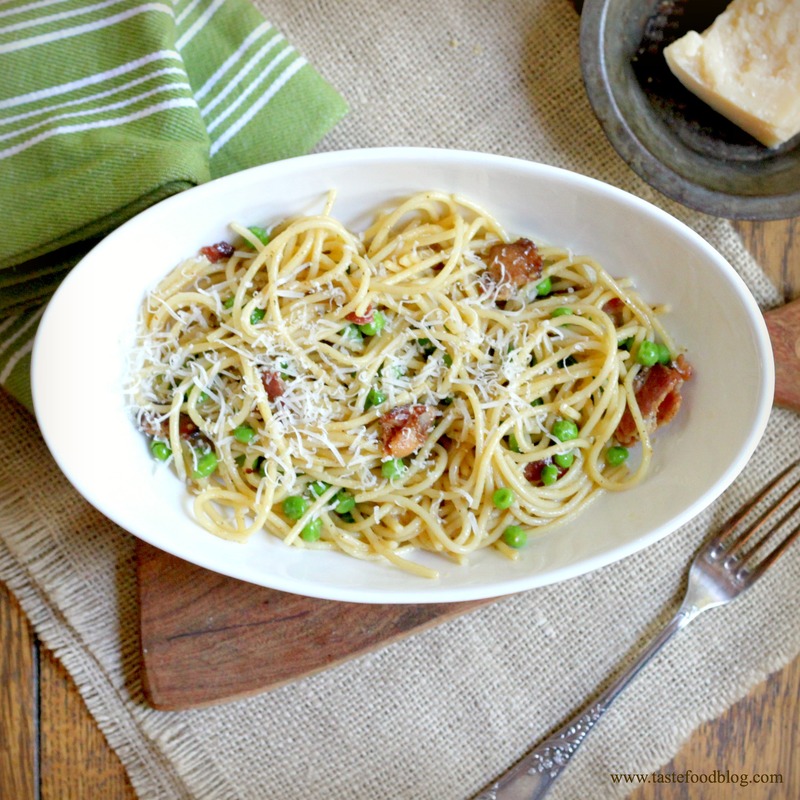 There is nothing more comforting than a bowl of pasta carbonara, the Roman answer to comfort food, with an egg-rich creamy cheesy sauce studded with crispy bacon and, in this recipe, sweet peas. Peas add freshness and a sweet counterpoint to the salty bacon, while providing the vegetable component to call this a complete meal in a bowl. 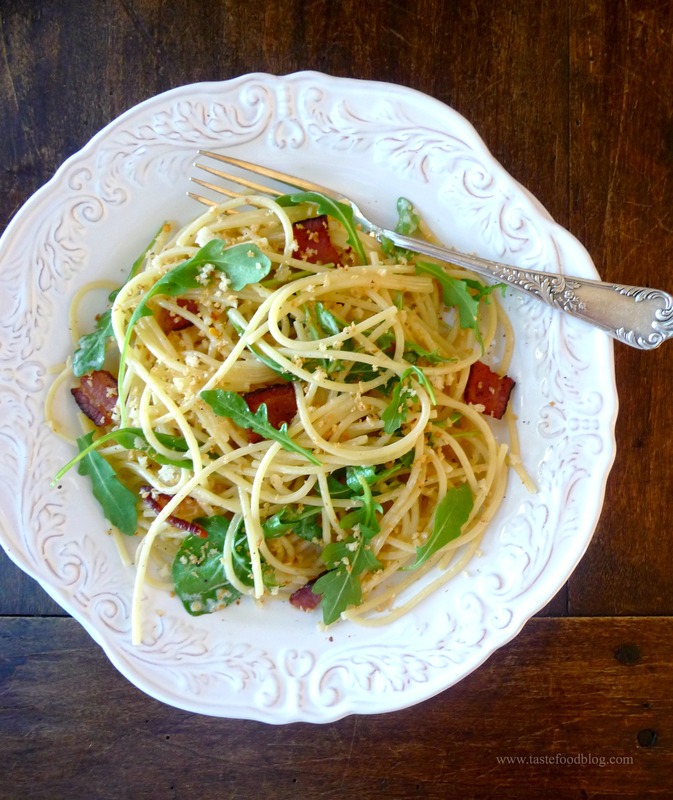 A sating and soothing meal at that – pasta carbonara for the belly and soul. The heat from the pasta will help to cook the eggs when combining. Be sure to do this away from the direct stove heat to prevent the eggs from scrambling. Bring a large pot of salted water to a rolling boil. Add the spaghetti and cook until al dente. Drain. While the pasta is cooking, heat the oil in a large skillet over medium heat. Add the bacon, stirring to separate the pieces, and cook until the fat is rendered and the bacon is golden brown, 4 to 5 minutes. Transfer the bacon with a slotted spoon to a plate lined with a paper towel. Drain off all but 2 tablespoons fat from the pan. Add the peas, garlic, and red pepper flakes and cook, stirring, until fragrant, about 1 minute. Add the pasta and stir to coat the noodles. Remove the pan from the heat and quickly add the eggs and cheese, stirring constantly to coat the pasta and to prevent the eggs from cooking. Return the bacon to the pan and stir once more. Serve immediately with extra cheese for sprinkling. If there is an Italian equivalent to the classic Jewish chicken soup, then I think it would be Pasta Carbonara. You can’t get more comforting than a deep bowl of noodles slicked with an egg-rich cheesy sauce redolent of bacon. The optional addition of sweet peas to carbonara is essential in my opinion. Peas add freshness and a sweet counterpoint to the salty bacon, while providing the vegetable component to call this a complete meal in a bowl. 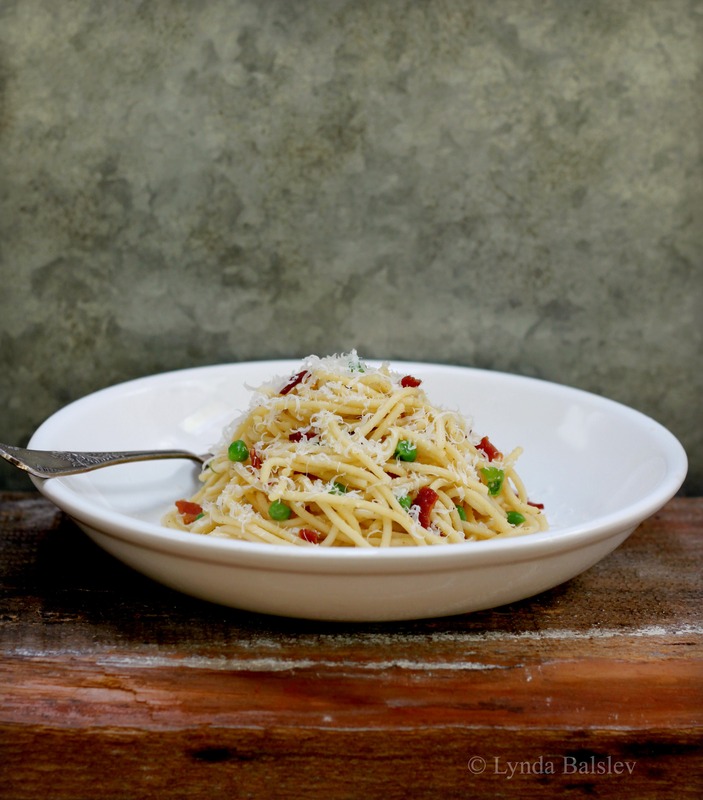 A sating and soothing meal at that – pasta carbonara for the belly and soul. While the pasta is cooking, heat oil in a large skillet over medium heat. Add the bacon, stirring to separate the pieces, and cook until fat is rendered and bacon is golden brown, about 4 minutes. Transfer the bacon with a slotted spoon to a plate lined with a paper towel. Drain off all but 2 tablespoons fat from the pan. Add the peas, garlic and red pepper flakes and cook, stirring, until fragrant, about 1 minute. Add the pasta and stir to coat the noodles. Remove the pan from heat and quickly add the eggs and cheese, stirring constantly to coat the pasta and to prevent the eggs from cooking. Return the bacon to the pan and stir once more. Serve immediately with extra cheese for sprinkling. 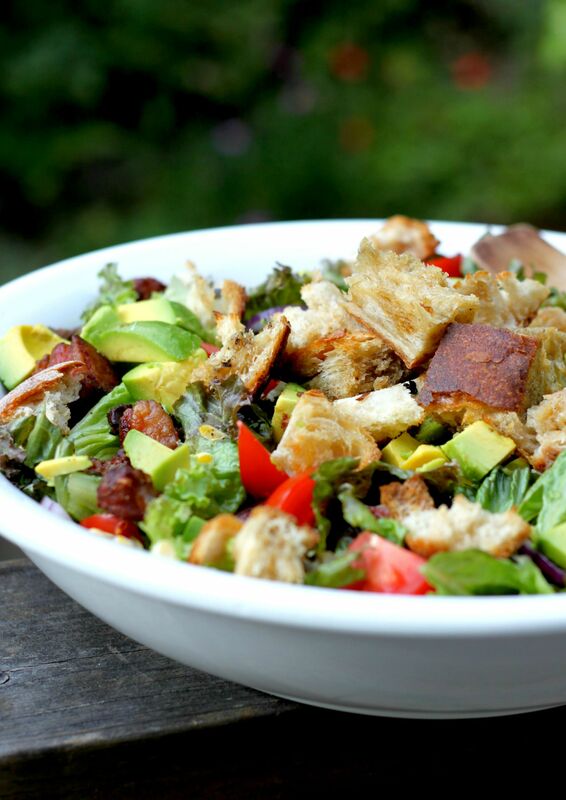 Are you looking for ways to get your family to eat brussels sprouts? 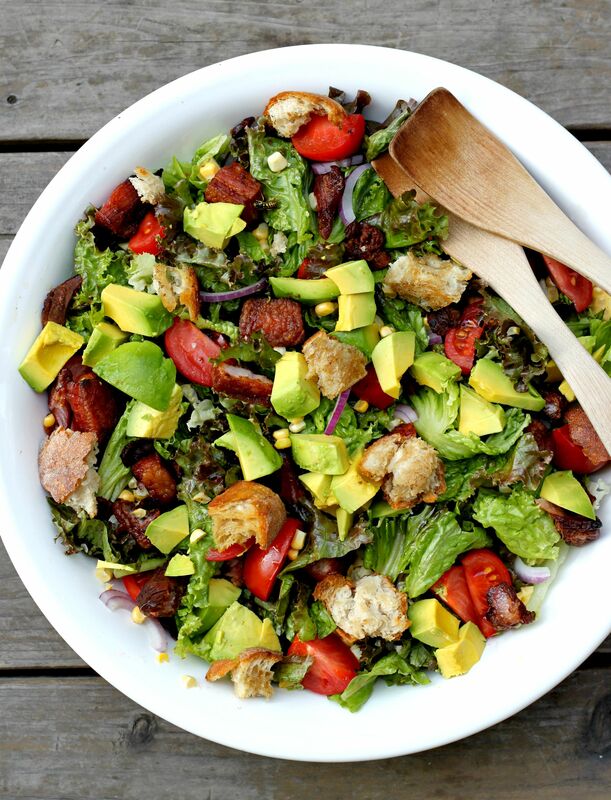 This recipe may do the trick – with a little help from bacon. Fresh yet hearty, full of healthy crucifers and dotted with crispy bacon, this simple dinner is perfect for an autumn weeknight. Cauliflower or broccoli may be substituted for the brussels sprouts. Bring a large pot of salted water to a rolling boil. Add the pasta and cook until al dente. Drain and transfer to a large bowl. 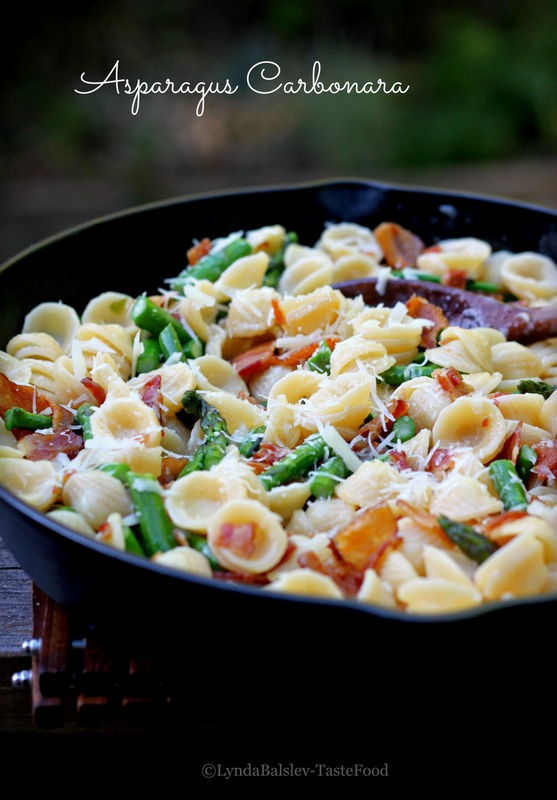 While the pasta is cooking, heat a skillet over medium heat. Add the bacon and cook until fat is rendered and bacon is golden. Remove with a slotted spoon and transfer to a plate lined with a paper towel. Discard all but 1 tablespoon bacon fat from skillet. Add the brussels sprouts and saute until they are crisp tender, about 5 minutes. Add the garlic and saute until fragrant, about 30 seconds, then add the chicken stock. Continue to cook until the brussels sprouts are tender, 3 to 4 minutes. Add the cream and simmer until thickened to a sauce consistency, about 2 minutes. Stir in the salt and pepper and check for seasoning. 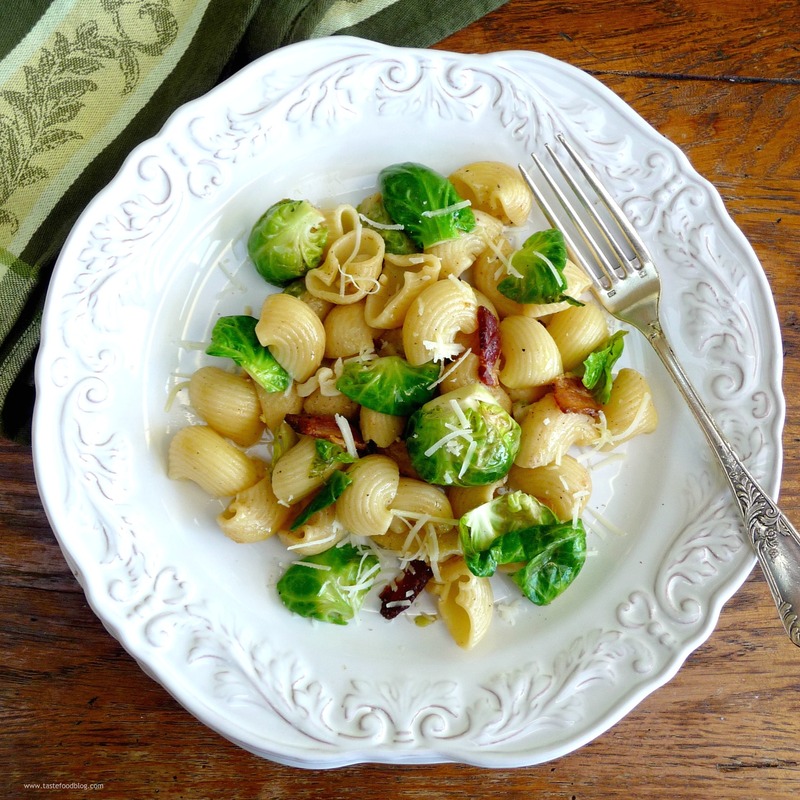 Add the brussels sprouts, bacon and cheese to the pasta and toss to combine. Serve with extra cheese on the side.